ENERGY-PLUS™ – Mountain Power, Inc. When your operation depends on a heavy-duty battery – a battery that can stand up and deliver even under the most punishing conditions – you can depend on the power of ENERGY-PLUS™. Want to increase your productivity with less change outs? If so, you need to determine which power solution option is right for you: (1) buy more standard capacity batteries, or (2) buy high-energy batteries. Do your current batteries have trouble lasting a full shift? Do you experience short battery life? Do you expect your duty cycle to become more demanding? Do your trucks operate in harsh conditions? Are your trucks required to make long runs and high lifts? Do your trucks operate with attachments that demand added power? Do you require at least five years of trouble-free power? If you answered “yes” to any or all of these questions, then a high-energy battery might be the right solution to meet your needs. 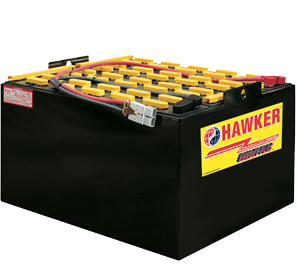 And not just any high-energy battery, but the ENERGY-PLUS™ battery by HAWKER. What’s the difference you ask? All high-energy batteries are not created equal! Some battery manufacturers of high-energy batteries use only an increase in specific gravity to achieve more power. The ENERGY-PLUS™ battery by HAWKER, on the other hand, employs a unique multi-plate design to pack more active material — and more power — into the same space. The ENERGY-PLUS™ battery’s key to delivering both more power AND longer life is maintaining a proper balance of active material and electrolyte. Unlike other “high-energy” batteries that rely solely upon higher gravity acid to deliver higher output, ENERGY-PLUS™ uses additional full-size plates in a balanced electrolyte to produce higher sustained voltages and longer run times — without sacrificing longevity. This advanced multi-plate design means your batteries provide ultimate power for a longer time. When you compare the lead/acid ratio between high-energy batteries and its standard counterpart, the proof is in the numbers. Longer Work Cycles – ENERGY-PLUS™ has a higher sustained voltage than any other battery in the industry. Added benefit: Your trucks move faster, work longer without recharging, and experience less motor wear caused by excessive amp draw. Lower Operating Costs – The ENERGY-PLUS™ battery offers an extended running time. Less change outs mean a reduction in spare batteries and chargers. And fewer batteries mean less water, fewer batteries to charge, and less room required for battery storage space. Added benefit: A reduction in total ownership costs because of higher productivity and the need for fewer batteries. Longer Battery Life – ENERGY-PLUS™ is designed with a balance of active material and acid volumes for higher energy AND longer battery life. The ENERGY-PLUS™ battery maintains an estimated cycle life of 1500-2000 cycles, based on one cycle per day and 80% DOD. Added benefit: Longer life means less expense. Up to 20% More Energy – ENERGY-PLUS™ delivers more power than conventional batteries without an increase in tray size. Added benefit: Allows trucks to operate longer per shift. Applications – The heavy-duty ENERGY-PLUS™ battery can be used in even the most punishing conditions. ENERGY-PLUS™ batteries are an excellent option for rapid or high-speed charging applications. Added benefit: Power that can stand up and deliver when you need it most. ENERGY-PLUS™ is specifically designed to stand up and deliver in the most demanding environments. For trucks that are operating in harsh conditions, making long runs and high lifts, and using attachments that require added power, ENERGY-PLUS™ is the battery that can keep them moving faster and working longer. Ask Mountain Power to conduct a WATER LESS Cost Saving Analysis for your company so you can see what a difference the WATER LESS battery can make on your bottom line.